A bold new approach to how we gather that will transform the ways we spend our time together - at work, at home, in our communities, and beyond. 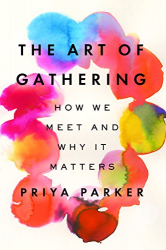 In the Art of Gathering, Priya Parker argues that the gatherings in our lives are lackluster and unproductive - which they don't have to be. We rely too much on routine and the conventions of gatherings when we should focus on distinctiveness and the people involved. At a time when coming together is more important than ever, Parker sets forth a human-centered approach to gathering that will help everyone create meaningful, memorable experiences, large and small, for work and for play. Drawing on her expertise as a facilitator of high-powered gatherings around the world, Parker takes us inside events of all kinds to show what works, what doesn't, and why. She investigates a wide array of gatherings - conferences, meetings, a courtroom, a flash-mob party, an Arab-Israeli summer camp - and explains how simple, specific changes can invigorate any group experience. The result is a book that's both journey and guide, full of exciting ideas with real-world applications. The Art of Gathering will forever alter the way you look at your next meeting, industry conference, dinner party, and backyard barbecue - and how you host and attend them.